Roger Goldring and Chris Roberts enjoyed the past two days course at Wrest Park (Bedrord), recieving coaching from England Internationals Lionel Tibble and Rachel Rowe. Good luck to Robin Coates and Edmund Shirley as they debut in 'outside competion' at the Hamptworth C-Level tournament this weekend. It ws good newas for 'The Class of 2017' who all graduated for 'mix-in' sessions today after four days of training classes. Frances Colman and Chris Roberts were joined by our newly qualified coach Raghu Iyer, as this week's eight were put through their final paces. Please make them most welcome at 'mix-in' next week. 4 April - Championship and Shield fixtures made - the first one is NEXT WEEK! 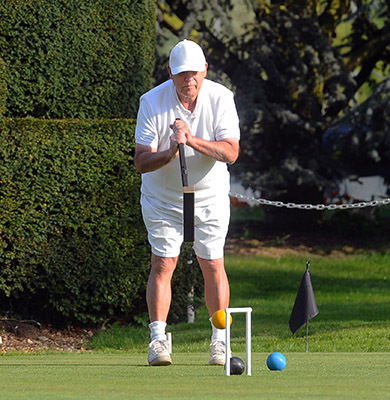 Phyllis Court 'A' will play Woking (away) in the firts round of the National Inter-Club Championship as soon as Tuesday (next week), as we look to replicate our excellent run to the semi-finals last season. Woking will be tough opponents and will likely field at least two minus handicapped players, backed up with AC specialists. PCC 'A' field their strongest line-up (excepting the unavailable Charlie von Schmieder): Chris Roberts (-2), Ian Norris (-1), Helen Fensome (1) and Frances Colman (2). Also arranged this week, is our first round tie in the National Inter-Club 'Murphy' Shield (which has handicap restrictions). Phyllis Court 'Murphy Shield' will play Hamptworth away on 9 May when new member this year. Phyllis Court ‘A’ got their National Inter-Club Championship campaign off to a good start with victory at Woking last week. Fielding their strongest possible line-up, save their sole international player Charlie von Schmieder who was unavailable, the Henley club were given a tough test by their hosts. Phyllis Court’s Frances Colman provided the ideal start for her side with a straight games victory in her morning singles match and Helena Fensome did well to come back from one game down to win her match soon afterwards. Woking stayed in the fixture with a win in the deciding game of the morning doubles over Chris Roberts and Ian Norris, leaving the tie poised at 2-1 with four afternoon singles to play. Fensome completed a good day’s work with quick win in her second match, but defeats for Roberts and Colman, the latter with some last hoop drama, tied the fixture at 3-3, as all eyes fell on Norris’ and the last match to finish. Norris had looked to be in control with a comfortable first game win, but some excellent positioning play from Woking’s Bernard Jones had taken the match to a deciding third game. Hoops were then traded in turn until Norris hit a crucial centre-ball clearance to give Phyllis Court game, match and fixture. They now play either Dulwich or Hunstanton in the National Quarter-Finals. Mike Town (-2) and Bernard Jones (0) beat Chris Roberts (-2) and Ian Norris (-1) 7-5, 7-4. Andrew Dutton (2) lots to Helena Fensome (1) 7-6, 4-7, 4-7. Sara Anderson (2) lost to Frances Colman (2) 2-7, 0-7. Bernard Jones lost to Ian Norris 4-7,7-5,5-7. Helena Fensome beat Sara Anderson 3-7, 5-7. Andrew Dutton beat Frances Colman 7-5, 3-7, 7-6. You can see all the season-long competition 'draws' on the website by returning to he home page and clicking on the buttons in the black panel on the left. Or they will be display in the pavilion from tomorrow (13th) lunchtime. 15 April - History made this weekend. . . and this is Association Croquet! 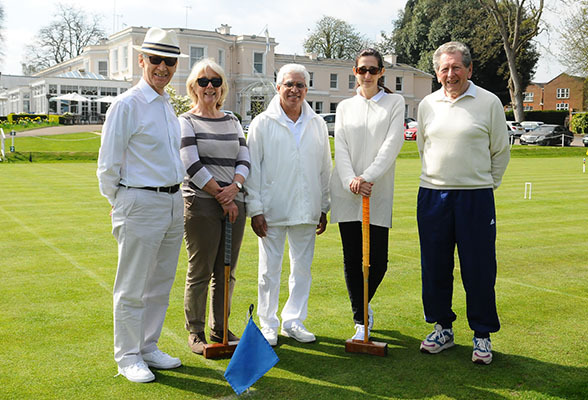 For the first time in at least 35 years (and quite probably ever) four Phyllis Court players participated in an ‘outside’ CA listed Association Croquet Singles tournament this weekend. We have grown used to a good PCC presence at similar GC events over the past few years but this upsurge in AC is quite something. I phoned Brian Bucknall this evening to check our history and he confirmed the historical truth of this moment. 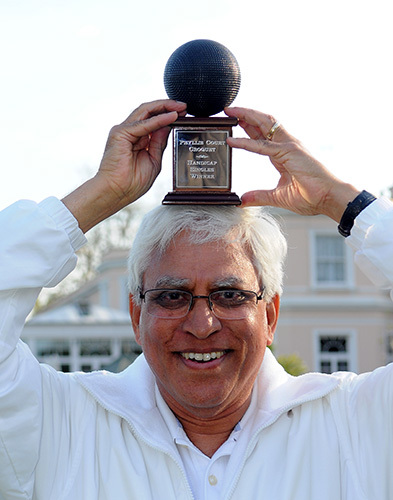 So congratulations to Raghu Iyer and Richard Peperell who enjoyed the 26 player strong Handicap Tournament at Surbiton alongside circuit regulars Frances Colman and Chris Roberts. Raghu Iyer used his extra turns to good effect to win our Handicap Singles Tournament today. A pleasingly full field of 16 arrived on time and played in a similar fashion allowing good progress of the event, and only a 'no time limits' regime meant a later than usual finish. Nearly everyone stayed to see Raghu presented with his trophy following a final with holder Roger Goldring that the former controlled nicely. 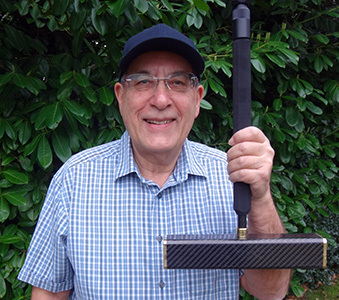 Philip Haydon announced is arrival from Dulwich CC with third place in his first PC tournament and relative newcomer Robin Coates (he started his croquet career only last year) scored a very creditable fourth place. The top four qualify as the PC representatives for the Area Finals of the All England Handicap Competition at Hamptworth on Sunday 13 August. Congratulations and welcome to Annie Arscot, Frances Lefeburre and Rosalind Grace. who completed their beginners training this week under the tutorship of Helena Fensome. Please make all three of them welcome when they attend thier fisrt 'Mix-in' session. 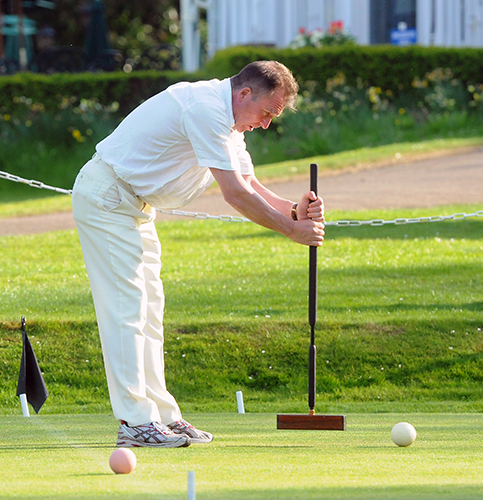 Peter Haydon won sufficient handicap index points to reduce his grade down to 2 at the Surbiton Open this weekend. He picked up a number of 'scalps' including a very acomplished display in defeating Chris Roberts (-2). Phyllis Court were well represented at this English National Singles Championship qualifier with three other players in the field. Helena Fensome (1), Roger Goldring (2) and Roberts all picked some good wins against higher ranked opponenets but all stumbled too in this first 'outside' tournament of the season. 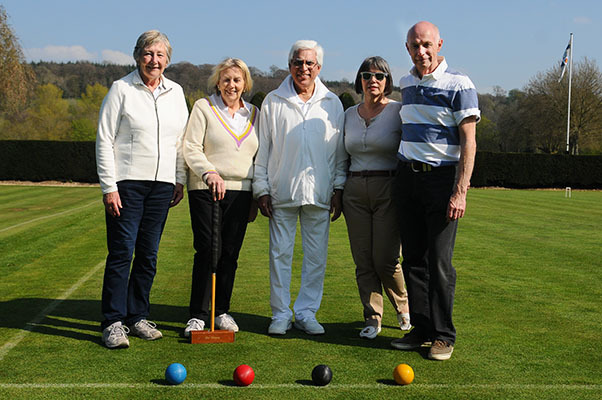 There was no holding PCC 'C' in today's traditional Handicap League opener when the trashed PCC 'B' with a 10-2 score-line. Leading 3-1 after two rounds of doubles, they took the tie beyond the 'B' with three more wins in the first round of singles. This meant the ‘B’ had to win all of the last round of singles just to draw - they lost the lot. The 'tale of the tape' reveals that the contest could easily have ended in a closer result with no fewer than 5 of the 8 singles games ending in 6-7 defeats for the 'B'. On fire for PCC 'C' were Captain Raghu Iyer, who halved his singles rubbers, and team mates Delia Norris, Ralph Chambers and John Maguire who all won both theirs. Licking their wounds for PCC 'B' were; Mike Fensome, Raymond Wood, Colin Morgan and Don Rutherford. Chris Roberts was undefeated in today's Charity One-Ball tournament but the real winner was Parkinson's UK who benefitted to the tune of £130. 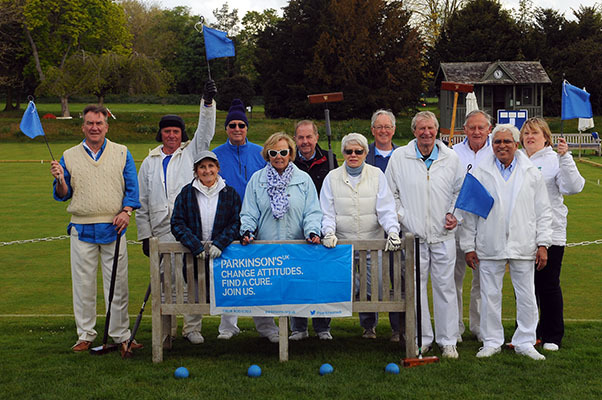 A field of 12, bedecked in the charity's blue house colour, survived a cold start and played six rounds of games before calling it a day. Roberts' closest match was a one point victory over Raghu Iyer and he met Peter Haydon in a last round de-facto final, in which nothing went right for the latter. Neither Roberts nor Haydon are available to play in the National Final and so our next two highest finishers will be offered the chance to represent us. Roger Goldring missed this event as he was away on a coaching course but generously donated a £10 entry fee to the cause anyway. Players taking part today: Chris Roberts 6 wins / 6 games (100%), Peter Haydon 4/6 (66%), Raghu Iyer 3/5 (60%), Joanna Iyer 3/5 (60%), Mike Fensome 2/5, (40%), Deon Melck 1/5 (20%), others completing 4 rounds only: Michael Seagrief 3/4, Dianne Browne 2/4, Ian Norrris 2/4, Steve Morton 1/4, Frances Colman 1/4, Di Pascoe 1/4. Our first 'local friendly' of the season saw pat Eades lead our team to an 8-4 victory over High Wycombe today. I'm yet to collect the full results sheet but understand that some long games meant that the fourth round was left un-played in favour of tea which drew compliments. It was good to see Steve Morton making his team debut in this match. At a wet and windy Sidmouth Open this weekend, Roger Goldring claimed enough index points to regain his former 1 handicap status. He picked up most points with a day 1 win over Chris Roberts (-2) which was very 'expensive' for the latter. Roberts and Helena Fensome both made the half field ‘cut’ but were knocked-out in the quarter-finals.